In the American movie landscape, the early part of the year usually means a few things. It's when the rest of the country gets to start catching up on Oscar hopefuls that opened at the end of the previous year in New York and L.A. It's also the season when unworthy films get dumped on an unsuspecting public (Man on a Ledge, anyone?). 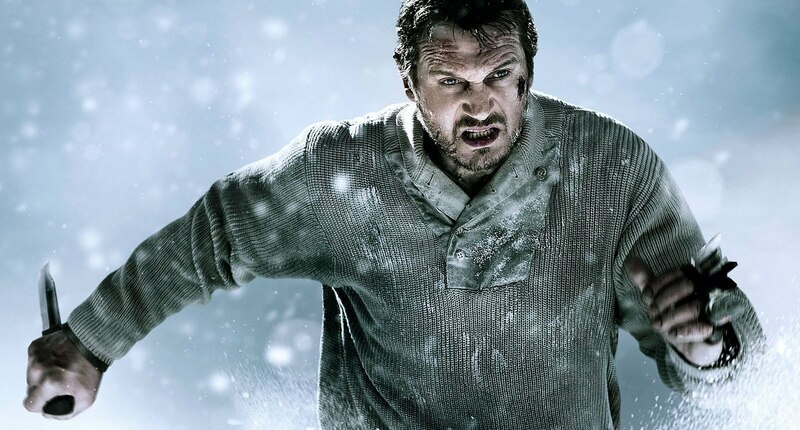 And finally, it's the designated release window for the semi-annual middle-age-action film by the lumbering Liam Neeson (Taken, Unknown). But this upcoming weekend's entry, Joe Carnahan's survival nightmare The Grey (based on a short story by Ian Mackenzie Jeffers), resembles Neeson's previous simplistic thrillers only from a marketing standpoint. 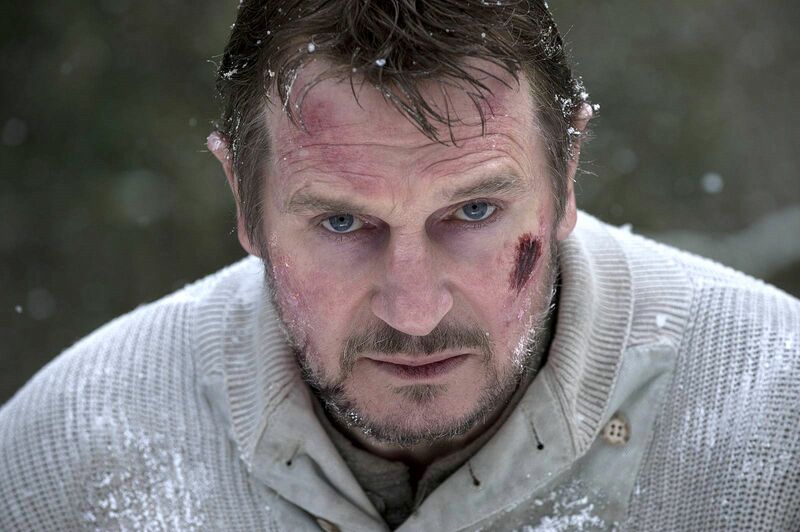 Though the story of a man fighting against nature in a snowy wilderness is unabashedly straightforward, Neeson and Carnahan (who previously collaborated on the dumb A-Team remake) plumb the depths of The Grey's central character, Ottway, and come up with some fascinating stuff. Distraught and near-suicidal, Ottway has retreated from civilization over what—he tells us in narration—is a permanent estrangement from his wife (Anne Openshaw). Ottway, a skilled sniper, defends an Alaskan oil rig encampment (populated by the requisite mixed bag of life's rejects) against stray wolves encroaching onto the work site. On some level, Ottway identifies with the creatures, admiring their single-minded vitality. It is the one quality which he now wishes he possessed after his separation. Respect for these beasts compels Ottway to stay with one of them as it dies from a wound he inflicted. And the invigorating late night howl of another wolf is the only thing which keeps Ottway from shooting himself in the mouth on another particularly depressing evening. So it is with great irony that this lonely, pathetic outcast—part of a crew flying to Anchorage for a much deserved weekend leave—finds himself as one of a handful of survivors of a plane crash facing the territorial animals. Now there's nothing unconventional about the setup, one has to admit. Unsurprisingly, when the site of the plane crash turns out to be within the "kill radius" of a whole pack of the threatening timber wolves—massive, ferocious and (wisely) largely unseen—The Grey becomes another take on the "Ten Little Indians" trope. You spend the next predictable hour trying to guess who's going to die next. After middle-management-dude Talget (Dermot Mulroney) sits at a campfire reminiscing about his young daughter's waist-length hair, you just know it's going to be him. 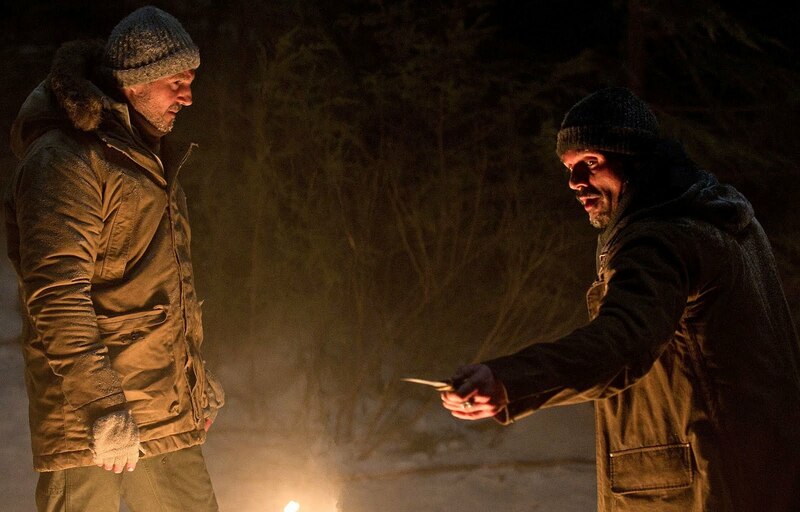 Or when the resident rebel, Diaz (Frank Grillo), challenges Alpha-male Ottway over who should be in charge—an apt if heavy-handed reflection of the power structure of the very wolves attacking them—then you can be sure that Diaz's subsequent redemptive apology is a signal that he's next in line. Except The Grey constantly confounds such expectations. Sure Talget dies, but it isn't right away, and when he does, the evocative description of his love for his daughter informs the elegiac depiction of his otherwise brutal passing in a way I don't ever remember seeing before. Diaz, a character who in any other movie would pay for his scoffing by dying the harshest of deaths doesn't so much die as fade away, elegantly, leaving an opening for him to return in the form of some deus-ex-machina, one could assume (wrongly as it turns out), to save Ottway in his darkest hour. The Grey consistently chooses the least predictable story options available, particularly in its stunning third act, which fulfills the promise of its early setup of Ottway's character. 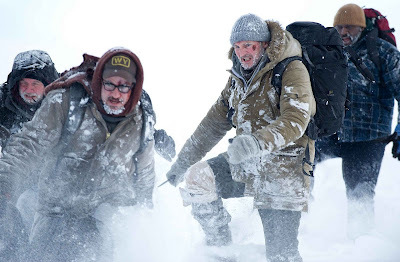 Ottway's philosophical ruminations on life, death and nature—while not exactly at the level of Hemingway, or even Jack London—make The Grey practically literary compared to Neeson's previous forays into thriller territory. The circumstances of Ottway's separation from his wife are revealed late in The Grey. It would spoil the film to say much more than that Neeson seems to be taking the bold step of allowing the recent, sudden passing of his wife, actress Natasha Richardson, to inform his performance in a quite revealing way. Yesterday, Carnahan spoke of his desire that the movie be re-released later this year to remind insiders of it in time for next year's big awards. 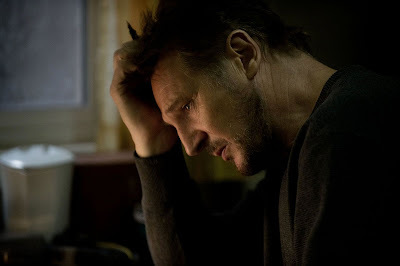 While I'm doubtful this will occur, Neeson definitely deserves some consideration. In the frigid wasteland, Ottway, who, for much of the film, has carried a not-so-secret death wish, ends up confronted with a situation where death is a near-inevitability. The Grey is not about whether Ottway will survive his ordeal; it is about whether he will fight to live in this most harrowing of circumstances. Some might find The Grey's abrupt conclusion to be frustratingly open-ended. But for the protagonist and the actor playing him, The Grey's finale is a transcendent affirmation of life in the face of despair. Nice review, Tony. I was surprised that both you and Glenn wrote positive reviews for this film because I personally find Carnahan to be such an off-putting filmmaker. You mentioned that his "A-Team" remake was dumb (which it is), and I disliked that lazy, generic film almost as much as I disliked his excessively violent, laughably overdone "Smoking Aces". He strikes me as the type of filmmaker who makes movies about tough guys mostly based upon movies he's seen about tough guys. When I watch his films all I really see is the imprint of someone who has soaked up a lot of crime movies and lacks interest in other genres and types of characters. This all being said, now that both you and Glenn have spoken favorably of the film I'm more inclined to check it out. The only movie Carnahan has made that I like is his character and performance driven 'Narc', and based upon your review maybe Carnahan has returned to putting character and performance above genre tropes and action spectacle. Aden, although, I wouldn't put THE GREY up at quite the level of NARC, it is his best movie since that one, by far. If I had any issues with it, they were mostly concerning some of the cliches of its second act. But the third act does such a good job of upending them, I left the screening a happy fan. Candace, I hope you like "macho" actioners (my wife does), because this one wears its testosterone on its sleeve. In tone and spirit, it reminds me a lot of FIRST BLOOD, an indubitably adrenaline-driven film but with a deeper soul than other movies of that type. I disagree with. I loved both A-Team and Smokin Aces. So I think i am going to enjoy the Grey when it does eventually come to Africa.